U.S. Sen. Ted Cruz, R-Texas, challenged President Barack Obama to a debate on refugee policy after Obama criticized the Republican presidential candidates who have spoken in favor of barring Syrian refugees from entering the United States. While he did not mention Cruz specifically, Obama said some of these politicians had personally benefitted from America’s acceptance policy in the past – possibly alluding to Cruz, whose father came to the U.S. from Cuba in the 1950s. "If you want to insult me, you can do it overseas, you can do it in Turkey, you can do it in foreign countries but I would encourage you, Mr. President, come back and insult me to my face. Let’s have a debate on Syrian refugees right now," Cruz said Wednesday. "Let’s have the debate any time and any place and if he actually wants to defend his policy instead of tossing cheap insults, I actually think that will be beneficial for this country." And here’s video of his comments, via NBC News. A super PAC supporting Cruz has released a new ad critical of GOP presidential rival Marco Rubio for his work on comprehensive immigration reform. Courageous Conservatives PAC, while supportive of Cruz, is not one of the main vehicles for outside, independent expenditures on behalf of Cruz. Those go under the moniker of Keep the Promise. 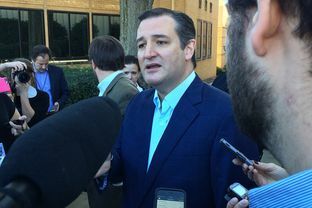 Cruz's presidential campaign on Tuesday announced it has reached a new organizational milestone: It has recruited point people in the congressional districts that make up the states that vote in the Republican primary before March 15. That equates to 163 so-called "coordinators" in 24 states. The achievement comes the month after Cruz's campaign announced it has county chairs in every county of the first four early voting states. The states where the Cruz campaign now has a full slate of congressional district coordinators are Iowa, New Hampshire, South Carolina, Nevada, Alaska, Arkansas, Alabama, Georgia, Massachusetts, Minnesota, Oklahoma, Tennessee, Texas, Virginia, Vermont, Wyoming, Louisiana, Kansas, Kentucky, Maine, Hawaii, Idaho, Michigan and Mississippi. At least one South Texas Democrat is publicly mulling a run for retiring U.S. Rep. Rubén Hinojosa's 15th District seat. Edinburg City Manager Ramiro Garza, noting that his current gig's term is wrapping up, said he is giving a congressional run serious consideration. “I was looking toward going to the private sector, but obviously the news of Congressman Hinojosa not running for re-election has given me something to think about," he said. "I'm interested in helping the region in any way I can," he added. Garza ran for Congress in 2012 in another district, Texas' 34th, and narrowly missed the runoff. U.S. Rep. Filemon Vela went on to win that seat in the fall. Garza said that campaign was a positive growing experience. "I learned about the importance of gaining broad-based support," he said. Specifically? He said that beyond building grassroots support, fundraising is key to winning. Another name floating in Democratic circles: Mission Realtor Dolly Elizondo, a former Hidalgo County Democratic Party chairwoman. Beyond the local posturing, the race has national implications. EMILY's List, a political action committee that helps elect pro-choice Democratic women to office, is prepared to get involved. “Electing women in seats like this is a central part of EMILY’s List mission to get more Democratic women’s voices in Congress and make the face of our government more reflective of the people they serve," EMILY's List spokeswoman Rachel Thomas said in a statement. With the filing period now open for the Texas primary, at least three Republican presidential candidates have signed up to be on the ballot. Former Florida Gov. Jeb Bush was the first to file Saturday morning, according to Cassie Daniel, senior director of party organization and training at the Texas GOP. Retired neurosurgeon Ben Carson filed later Saturday, and billionaire Donald Trump filed Monday. To qualify for the presidential ballot in Texas, GOP candidates have to pay $5,000 or gather 300 signatures from registered voters in each of Texas' 36 congressional districts. Texas Railroad Commission Chairman David Porter is calling on the federal government to bolster security along the state’s border with Mexico — if only to protect the state’s sprawling network of oil and gas pipelines.